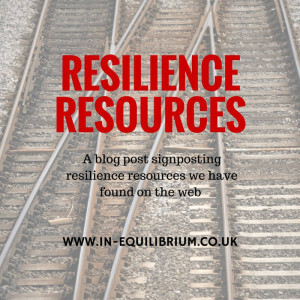 We hope you find the following resilience resources interesting. We have tried to focus on articles which give useful, usable information and tips on how to improve your resilience. There are a few links to material positioned elsewhere on this website but mainly these articles are ones that we have found over the course of our work in resilience and thought they were too good to keep to ourselves! We would like to encourage you to link/share this page and spread the word that resilience is something that can be learned and the first step is becoming more aware of what it is. Hopefully some of these articles will help with that. If you know of a resource that we haven’t mentioned here, please use the Contact Us page to get in touch. If appropriate we will include it. A paper which summarises the importance and benefits of resilience at work. It includes details of a study which was undertaken to develop an understanding of personal resilience that could be used to develop training to enhance resilience of staff at work. Including facing your fears, the importance of a moral compass, having resilient role models and keeping your brain strong. Created by Dr Sven Hanson of the Resilience Institute, this article looks at the relationship between bounce, courage, creativity and connection. He has a pleasant writing style and provides concise tips with a list of further reading and resources at the end. Written by the Psychology Foundation of Canada, this article focuses on the areas of competence, optimism and coping skills. It also provides brief suggestions on ways to build these skills. If you are a reader of our popular bi-monthly newsletter, you may have seen this paper already, as it was popular when we highlighted it as a resource. It asks if organisations are equipped to thrive in an environment now characterised by change and uncertainty. There is an interesting infographic about counting the cost of 5 years of change, and it ends with a section on strategic workforce planning. Focused more on birth to 6 years, but perhaps of interest to all ages, this pamphlet looks at areas such as building caring relations, being a positive role model, developing self-control and developing thinking skills. Produced in Sept 2014 and written by Dan Lucy, Meysam Poorkavoos and Arun Thompson, this paper sums up the results of an extensive literature review and a survey of contemporary UK Managers in the production of a personal resilience model based on the following five key capabilities: Perspective, Emotional Intelligence, Purpose Values & Strengths, Connections and Managing physical energy. Produced by the Chartered Institute of Personnel and Development (CIPD), this handy guide gives guidance to practitioners based on the evidence regarding how to develop resilience at both the individual and the organisational level. Practical guidance in promoting the resilience of individuals and teams within companies as part of an integrated health and wellbeing programme. This Conference paper by Donald Meichenbaum, PhD explores what factors contribute to resilience. Resilience is the process of adapting well in the face of adversity, trauma, tragedy, threats or significant sources of stress. Resilience is not a trait that individuals either have or do not have. Resilience involves behaviours, thoughts and accompanying feelings that can be nurtured, developed and learned. It contains lots of interesting information including the fact that individuals who are low in resilience are at risk for experiencing stress, depression, anxiety and interpersonal differences. It looks at evidence of resilience in returning service members and their family members, as well as evidence of resilience in civilian populations. There are several excellent resources including “Prescription for a resilient life”, “How to create a healing story” and questions to help build “My personal resilience plan”. A summary of the main aspects of resilience with reference to being a parent and supporting your children towards being more resilient. The article, used in child care centres in Canada, breaks resilience down into 7 main abilities: Being in charge of our emotions, Controlling our impulses, Analysing the cause of problems, Maintaining realistic optimism, Having empathy for others, Believing in our own competence, and Reaching out. A brochure which is intended to help readers take their own road to resilience. The information describes resilience and some factors that affect how people deal with hardship. Much of the brochure focuses on developing and using a personal strategy for enhancing resilience. Aimed at clinicians, this article describes a four-step model to help clients build on their positive qualities including finding ways to search for hidden strengths in everyday experiences. A report by the University of Edinburgh focussing on the emotional resilience of Social Workers in their challenging organisational settings. The subject of personal resilience broken down into 10 parts including 2 general principles. A simple guide outlining the areas to work on. This think piece from the Young Foundation explores questions about the relationship between wellbeing and resilience. Looking at what aspects of our lives contribute to greater wellbeing and resilience, who is faring better and who is vulnerable. From a community and individual perspective. This article discusses the concept of “acceptance” and the fact that it is generally associated with resigning ourselves to situations or not trying to change them and this is often seen as weak. “Accepting what is” is very different. It means not wishing something was ALREADY different. Wishing things were already different is wishing for the impossible. Almost all unhappiness, dissatisfaction and stress involves wanting something to be already different. The only exception is worrying about the future. “Accepting what is” is helpful in any challenging situation, whether or not we can immediately change it. When we “accept what is” we can focus only on what we need to do to resolve the situation or improve the future. The article goes on to make us see that we all have a choice as to whether we accept our position with resignation or resilience. This article, by Támara Hill, focuses on the link between poor emotional attachment and poor boundaries. It is important to be able to identify when your boundaries need to be adjusted in your relationships (personal and professional) and Támara has developed a list of signs that you may need to employ stricter boundaries. A discussion about Bibliotherapy and how reading books can improve social perception and empathy. A 2011 study published in the Annual Review of Psychology, showed that when people read about an experience, they display stimulation within the same neurological regions as when they go through that experience themselves. People with poor people skills can often find themselves in the middle of unnecessary conflict. In this article, Ruth Hill and the Mind Tools Team explain how you can improve your soft skills by developing the ability to empathise with others. A white paper produced by the Centre for Creative Leadership which examines the link between empathy and performance. Making the clear statement that empathy, like the other resilience skills, can be learned. An infographic which looks at how empathy helps and ways to inject some into your life. A brief article about empathy in the workplace. Is Empathy an Essential Tool in Today’s Workplace? A video clip discussing how empathy in the workplace can revolutionise business. Is this the dawn of the empathy era? Business leaders discuss why they believe empathy is an essential tool in the corporate world and how it can open the door to profit, wellbeing and a happier workplace. An article focusing on the belief that empathy is a choice that we make, whether to extend ourselves to others. The “limits” to our empathy are merely apparent and can change, sometimes drastically, depending on what we want to feel. A sample of activities and exercises, courtesy of YouthLight Inc, to help people assess their ability to use impulse control in various settings and to begin to feel excited for potential improvement. The Marshmallow Test review – if you can resist, you will go far. Do you take your gratification instantly or defer it? And why does it matter? An article by Zoe Williams, The Guardian, discussing how American psychologist Walter Mischel tests your willpower. A brief summary of internal and external loci of control and how they impact on resilience. A 5 minute video which explains and gives examples of the difference between an internal and an external locus of control. In personality psychology, locus of control refers to the extent to which individuals believe they can control events affecting them. The focus of this paper, featured in the International Journal of Scientific and Research Publications, is to give practical suggestions for creating a workplace that is conducive to being confident, hopeful, optimistic and resilient, thus promoting a sense of well-being. Optimism is a tendency to expect good things in the future. This literature review demonstrates that optimism is a mental attitude which heavily influences physical and mental health, as well as coping with everyday social and working life. This article by the University of Kent Careers and Employability Service, is aimed at students and graduates seeking employment. However, it is a useful resource for anyone wishing to improve their problem solving and analytical skills. This piece by Alan Chapman, Businessballs.com, provides some simple processes for problem-solving and decision-making. ‘Reframing helps you put events and circumstances into a different context that is more favourable.’ In this post on IQ Matrix, Adam Sicinski looks at Framing and Reframing Your Thoughts. Adam outlines clear examples of reframing when faced with a problem or an unhelpful state-of-mind. Available to download courtesy of Psychology Tools, this information sheet gives details of 10 common cognitive distortions. A brief exercise sheet which provokes thinking around emotion regulation. This article, (in a pdf download), by Sander L. Koole, V University Amsterdam, reviews modern research on the psychology of emotion regulation. This post by Thorin Klosowski, is entitled ‘The Importance of Self-Awareness, and How to Become More Self-Aware.’ Thorin explains that the more you know about yourself, the better you are at adapting life changes that suit your needs. The University of Buffalo, School of Social Work has a number of resources relating to self-care which are useful for both students and professionals. The information ranges from an introduction to self-care, to developing a plan and exercises and activities to help you flourish. This feature by Alexandra Duron, entitled, ‘25 Science-Backed Ways to Change Your Life by Taking Better Care of Yourself,’ includes strategies to help reduce stress, boost happiness and improve total health. This ‘Self-Care Toolkit’ has been developed by Pete Moore who has persistent pain, asthma and osteoarthritis, along with the help of Dr Frances Cole, GP. A persistent health problem can be difficult to understand and manage on an everyday basis. The self-management toolkit is a simple information booklet that could provide you with some handy tips and skills to support you along the way to manage your health and your condition. This booklet, produced by Mind, is entitled ‘How to increase your self-esteem.’ The content includes strategies to help you challenge negative feelings and beliefs you hold about yourself. It explains where these beliefs come from, how they become fixed and gives suggestions to help you change them. This self-help guide created by the Department of Psychological Services & Research, NHS Dumfries & Galloway, looks at what constitutes self-esteem; motivation to change; challenging your negativity; changing behaviour and how your level of self-esteem varies throughout life. This paper about Self-Efficacy by Albert Bandura of Stanford University covers 4 main topics: Sources of self-efficacy beliefs; Efficacy-mediated processes; Adaptive benefits of optimistic self-beliefs of efficacy and development; and Exercise of self-efficacy over the lifespan. This document, compiled by a Research Team at UCL, provides guidance material to assist Health Trainer Services in assessing clients’ confidence and beliefs in their ability to achieve their health goals – that is, their ‘self efficacy’. The document contains questions and prompts which can be used to measure self-efficacy during a consultation. This paper is an examination of resilience levels amongst adolescents and results discuss the importance of some resilience skills over others. An appendix of questionnaires used is included. This study examines Self-Efficacy and Health Behaviour Theories. According to Social Cognitive Theory, a personal sense of control facilitates a change of health behaviour. This research looks at perceived self-efficacy in relation to physical exercise, smoking, alcohol consumption and other health issues. This article, written by Barry J. Zimmerman of the Graduate School and University Center of City University of New York, outlines the importance of self-efficacy and in particular, the role of self-efficacy in academic motivation. This fact sheet from ReachOut.com entitled ‘Self-talk – having good thoughts’, explains how positive self-talk will help boost your confidence, build your self-esteem and make you feel better about yourself. This article on the “Wikihow” website contains scenarios and practical exercises you can use to improve your self-talk. An article by Mayo Clinic Staff, promoting the benefits of building and improving a good social support network and the positive effects this will have on your ability to combat stress and improve your overall mental and physical health. Corey M. Clark’s paper (Rochester Institute of Technology) entitled “Relations Between Social Support and Physical Health“, discusses the implication of social support and people’s physical health, divided into three age groups: adolescences, middle-aged adults, and older adults. A review article which aims to summarise key studies on social support in the context of resilience to stress and explore possible brain mechanisms mediating social support’s positive influence on mental health outcomes. Interesting article about the belief that willpower is limited and the impact this limiting belief has on your actual willpower. The article encourages using exercises to teach people non-limited theory and effective self-regulatory strategies, arguing that this could increase their success as they face stressful demands and strive to accomplish their goals. This post by Adam Sicinski outlines strategies which, with regular practice, will help you develop ‘Resilient Willpower. ‘ According to Sicinski, cultivating resilience and willpower is about having the courage to make the toughest of decisions in the face of adversity. A document produced by the American Psychological Association which covers the subject of ‘Willpower – The Psychological Science of Self-Control‘.